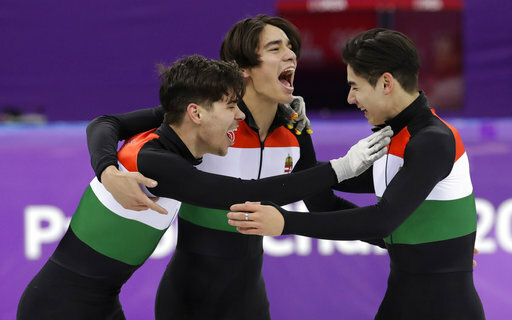 Hungary had never been on the top step of the medal podium at the Winter Olympics. Heck, the Hungarians hadn't been on the podium at all in nearly four decades. Liu Shaoang, Liu Shaolin Sandor, Viktor Knoch and Csaba Burjan ended the drought, giving their country its first winter gold on the final night of short track at the Pyeongchang Games. They crossed first in the men's 5,000-meter relay, setting an Olympic record of 6 minutes, 31.971 seconds. The Hungarian team caught a huge break when the favored South Koreans crashed during the race, knocking them out of contention. The silver went to China, while Canada claimed the bronze. Before the short track victory, Hungary's last winter medal was a silver in ice dancing by Kristina Regoczy and Andras Sallay at the 1980 Lake Placid Games. 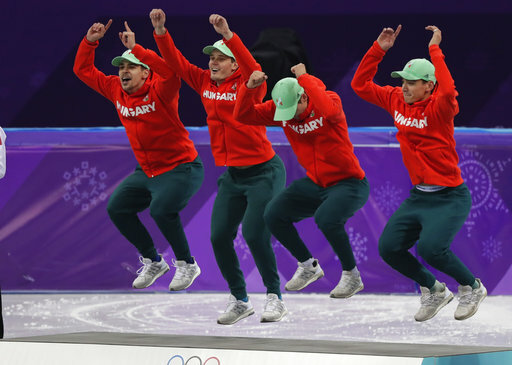 In fact, all of Hungary's six previous winter medals were in figure skating. None were gold. "It's been 38 years since our last medal," Knoch said. "It was a lot of pressure, to be honest, from the whole country. I think everybody felt this weight on their shoulders." Canada was leading with three laps to go, but Hungary surged to the front with a lap remaining and held off China. "Everybody put their maximum into the relay," Knoch said. "This was our last chance. We wanted to get a medal for our federation and our country. It's unbelievable that we got a medal _ and it's gold. It's really hard to understand what just happened."